11) 10/29/17 Since April of 2016, Obama's campaign organization has paid nearly a million dollars to the law firm that funneled money to Fusion GPS to compile a dossier of unverified allegations against Donald Trump. 12) The article highlights this lawsuit that is even more trouble. 16) DNC’s disbursement was ↪️not↩️ for “research consulting,” it was for actual research. It also ↪️concealed↩️ the true recipient of the disbursement. See infra ¶¶ 17-18. 18) Footnote 10. In fact, the report was so misleading that even individuals associated with the committee could not discern why the disbursement was made. Turns out those additional Chinese uranium mines in 🇺🇸have a contract with Tony's ex-wife and fellow Clinton campaign bundler Heather Podesta! Specifically, China and Russia not reported at all on the Attorney General's semi-annual reports 2014 - 2017. @realDonaldTrump Whoa. Saturday Night Live is humorous satire. Trump’s personal anger against freedom of speech and dissent in our country is reminiscent to North Korea’s Kim Jong Un and Russia’s Putin. Trump is becoming increasingly unhinged. This is very concerning. 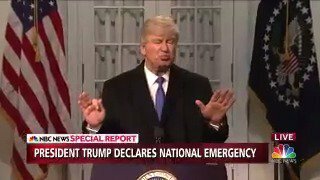 @realDonaldTrump This must be one of the clips on Saturday Night Live that is making Trump so upset like a petulant dictator. It’s about his fake national emergency declaration and Trump is literally at Mar-a-Lago probably tweeting on the toilet before another day of golf. @realDonaldTrump When Trump tweets, “how do the Networks get away with these total Republican hit jobs without retribution?” we should be very concerned as both Democrats and Republicans alike. Trump literally wants to use his power as president to punish the media for making some jokes on TV. According to @IlhanMN, lenient sentencing would somehow create less of an incentive for future recruits to join ISIS -- which is absolutely naïve, outrageous, and lacks evidence. (3).